Description: Cap: 6 to 32 cm broad, convex expanding to plane; surface dry with yellow-brown to brown scales. Veil: cottony patches, later becoming membranous, forming a skirt-like annulus. Gills: close, free, pale pink at first, then blackish-brown at maturity. 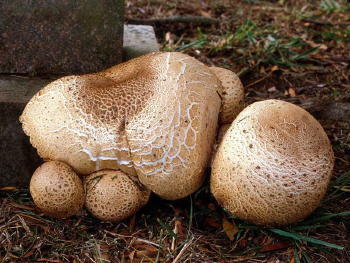 Stem: 10 to 37 cm long, up to 6 cm thick, equal to enlarged at base, frequently buried; smooth above ring, scaly below. Flesh: thick, firm, white, may discolor yellow when bruised. Smell: sweet, anise or almond-like. Spore print: chocolate-brown. Habitat: Late summer and early fall, single or in groups or clumps on ground in deciduous or coniferous woods, gardens, roadside. Primary Keys: Yellow-brown scaly cap, sweet odor, blackish free gills, prominent ring. Edibility: Choice: an excellent edible, one of the very best. A good drying mushroom. Notes: One our largest (one foot diameter & one pound) and most spectacular Agaricus species. Since it’s common in landscaped areas, be wary of chemical treatments and heavy metal bioaccumulation. Unfortunately it is frequently infested with fly larvae. If so, bring those home and inoculate your fresh landscaping! In a large skillet, melt margarine over medium heat. Add onion, garlic, and mushrooms. Saute until tender but not browned. Add tarragon, stir until it is softened. Pour mixture into a bowl or food processor. Add remaining ingredients. Process until mixture is smooth. Spoon into a serving bowl and garnish with chopped chives. Serve with thick slices of crusty French bread, thin slices of whole wheat bread, or unsalted whole wheat crackers.